Regarding our nation's recent statements on the U.N. resolution condemning Israeli settlements, I will have more to say on that tomorrow. But today, I will let the Bible make its own statement(s). From the beginning of her history, the nation of Israel has been beset by surrounding nations, who have declared themselves her enemies. Nothing has changed in 3,000 years. Whether it be via the Canaanites, or the modern-day Palestinians, the nations of the world have aligned themselves against the people of God. 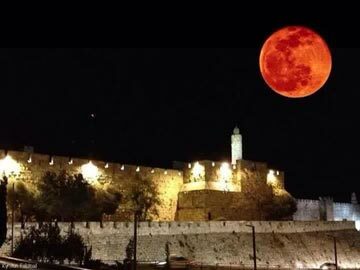 But what the world has never understood is the truth as expressed in Zechariah 12:8 -- that God can [and will] supernaturally protect and defend Israel against attack -- especially His eternal city, Jerusalem. As evidenced by today's battle over the capital city, the Arab peoples surrounding Jerusalem have a passion for possessing the city that, upon historical and religious analysis, does not appear to be justified. Muslims claim Jerusalem as their third-holiest city, but Jerusalem is not mentioned once in the Koran. In fact, Jerusalem’s importance to Muslims comes from the belief that in the Dome of the Rock shrine there is a rock where two significant things happened: 1) where Abraham intended to offer Isaac as a sacrifice, and 2) where Mohammed allegedly ascended into heaven. Though this tradition is firmly rooted in the Muslim mind, it is of recent origin. It was invented by Yasser Arafat’s uncle - Haj Amin el-Husseini, who was the past Grand Mufti of Jerusalem. He promoted this myth in the 1920’s and 1930’s to arouse Arab passions against the growing Jewish presence in Jerusalem. The Dome of the Rock was built not because of the Koran, but because the Muslim ruler, Abdal-Malik, wanted to gain revenue from pilgrims and worshippers, and because he wanted to prevent the rebuilding of a Jewish Temple. The Temple in Jerusalem has always been recognized as the dwelling place of YHWH, and followers of foreign gods have done everything they could to prevent God's Presence from being established in Jerusalem. In the recent decades of peace negotiations between Israel and the Palestinian Authority, Israel was willing to concede almost everything to the Palestinians in an amazing willingness to make peace. The only thing Israel would not concede was sovereignty over Jerusalem. The recent problems between Jews and the Arab world may have centered around Israeli settlements, but at the heart of it has alway been this one sticking point: Jerusalem. What is even more astonishing is that in Zechariah 12:4, just a few verses prior to the one I have chosen, God tells us, And in that day I will make Jerusalem a heavy stone for all the peoples; all who lift it will be severely injured. And all the nations of the earth will come and be gathered against it. We see that being fulfilled in the U.N. resolution this past week. Who could have imagined when the Old Testament was written that all the nations of the world would be involved in deciding the fate of Israel? And this involvement of all nations in dividing Israel has occurred exactly as prophesied and is still in the process of being implemented. But the nations of the world would do well to contemplate what YHWH says in verse 8... The feeblest among the people of Jerusalem will be like King David; men of war, bold and brave, skillful and strong. The Angel of the Lord will go before them, just as He did in the Exodus and their establishment in the Land. He will guard His eternal city in supernatural power. And like God, the city and the people will maintain their supremacy in the world. This Scripture gives us, the Faithful, the hope and knowledge that men and their councils will never destroy Israel's place in the world, as guaranteed by the Lord. And as a last thought... perhaps the nations of the world should pay heed to the next verse in Zechariah. Verse 9 says, And in that day I will seek to destroy all the nations that come against Jerusalem. The United Nations and the leaders of the world would do well to listen to the voice of God.